If you want to know what is Captain America’s origin and how it all started for the first avenger keep reading, at Superheroes Central we love the classic superheroes and we know others do too. He’s been around for nearly eight decades and was retrospectively granted founding member status in the avengers, a select group of earth’s mightiest heroes featuring other iconic heroes like Iron Man, Spiderman and Thor. If you want to also know about Captain America’s powers and abilities just click here, but keep reading to find out how it all started. When was Captain America created? It was in December 1940, designed as American patriot themed supersoldier created by Jack Kirby and Joe Simon, he first appeared in Captain America #1 published by Timely Comics an earlier incarnation of Marvel Comics. in 1940 Joe Simon created a sketch and scribbled Super American at the bottom of the page, but Joe Simon reconsidered the of the character because at the time there were a lot of ‘Super’ characters and opted for a name change and Captain America was born. After getting the go ahead from Timely Comics publisher Martin Goodman, Joe contacted the now legendary Jack Kirby about pencilling the artwork. Despite Joe considering a team of artists on the first edition to make the tight deadline, Jack Kirby gave his assurance that he could in fact get the whole issue done on his own before the deadline. The first issue was inked by Al Liederman, and lettered by Howard Ferguson. Although Captain America #1 was cover dated March 1941 it actually went on sale early in December 1940 as was common practice at the time. World War 2 had been going for over a year at this point and it would be another full year before America would enter the war after the surprise attack on Pearl Harbour. Joe Simon originally conceived Captain America as a political creation that America should join the war as he felt that it was inevitable that the United States of America would eventually be drawn into the conflict. While the first issue was a huge success depicting Captain America armed with sidearm and shield punching Nazi leader Adolf Hitler in the face and selling one million copies. It did have it’s detractors and opponents with Timely Comics receiving hate mail and threats, and even groups of people menacing the Timely Comics’ offices, the situation grew so bad that new York Mayor Fiorella La Guardia personally contacted Joe Simon and Jack Kirby to voice his support and police officers were posted outside the comics’ offices. Another issue that needed resolving was that MLJ Comics complained that Timely Comics’ Captain America’s triangular shield too closely resembled MLJ Comics’ triangular chest emblem on the character Shield. This issue was rectified for Captain America issue #2 with the character receiving his now iconic round shield, a move which heavily influence the character as the shield would now become Captain America’s main offence as a returning throwing weapon. With this decision made no longer would Captain America wear his sidearm. How did captain america get his powers? Captain America’s real name is Steve Rogers and he was born in 1920 to Irish Catholic immigrant parents Sarah and Joseph Rogers in the Lower East Side of Manhattan, Steve’s father died when he was just a child and his mother died when Steve was in his teens. As a young man Steve is disturbed by news reels of Nazi and Japanese atrocities and enlists in the army but is rejected due to his frailty, overhearing Steve’s earnest pleas and impressed by his conviction and resoluteness Army General Chester Phillips offers Steve a place in a top secret experiment codenamed Rebirth. The objective behind operation Rebirth is the creation of super soldiers, the program is run by German scientist Dr Abraham Erskine. Dr Erskine administers Steve with a serum that is combination of oral and intravenous treatments and exposure to Vita-Rays, as the projects first test subject Steve Roger’s transformation is hailed a success. Steve’s body and mind are augmented and gains increased strength and muscle mass, enhance reflexes and agility as well a superbly conditioned mind. Fearing potential abuse of his experimentation Dr Erskine refuses to commit the entire process and procedure to paper, just making imperfect documentation of the process. Unfortunately Dr Erskine is soon killed by Nazi spy Heinz Kruger. Steve’s first official act as America’s premiere super soldier is avenge Dr Erskine’s death and Heinz Kruger is killed in the ensuing chase. With Dr Erskine’s death the exact formula and process has died with him and other scientist are unable to duplicate the results, leaving Steve Roger’s as America’s lone super soldier. Not wanting this fiasco to be made public, the government initiates a plan to make Captain America a special operative and counter-intelligence officer as a direct response to Nazi Germany’s wartime super villain Red Skull. Steve is sent to Camp Lehigh in Virginia where meets and befriends a young man named James Buchanan Barnes, who using the alias Bucky would go on to become his sidekick for many years. 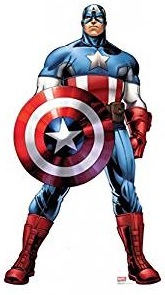 As Captain America Steve is issued with a sidearm and a bulletproof triangular shield, but see the potential of Captain America not just as a super powered operative but also as a massive propaganda weapon President Franklin D Roosevelt orders the construction of a far superior shield which is round in shape and made from vibranium and nearly indestructible. This new shield becomes Captain America’s new offensive weapon and he no longer carries a sidearm. During World War 2 Captain America fights both Nazi and Japanese forces as well as super villains with their own nefarious plots, but in the final days of the war Captain America and Bucky were trying to foil a plot by the villain Baron Zemo which intended to destroy an experimental drone plane, both Bucky and Steve were able to board the explosive laden drone just before take off. As the drone flies over the North Atlantic Ocean, Bucky tries unsuccessfully to disarm the explosives causing them to detonate, whilst Bucky is presumed killed, he is actually thrown clear of the blast suffering grievous wounds and enters a state of suspended animation and is soon found and picked up by a Russian submarine. Steve is also flung into the freezing waters where is encased in a block of ice and also enters a state of suspended animation. His body is body is found decades later by the newly formed avengers as they conduct a search for Namor the sub-mariner. At this point in time the Avengers consist of the founding members of Ant Man, Iron Man, Thor, Wasp and the Hulk, but Captain America is given retroactive founding member status in place of the Hulk. Steve’s enhanced physiology and extensive combat training and experience make both a valuable member of the team and natural leader. Although Captain America would serve with Avengers for decades to come he did take breaks from the active team roster and even came into disagreement with Avenger policies from time to time, but he is generally considered the heart and soul of the Avengers. 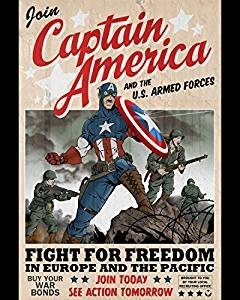 All images featured on this page are available from Amazon, also click if you would like to see a selection of the best Captain America accessories, or find out more information on other awesome superheroes at Superheroes Central.